Cinterion MC52i terminal module is the advance version of MC52. The MC52i module handles all processing for audio, signal and data within the MC52i Terminal. Internal software runs the application interface and the whole GSM protocol stack. This is a dual band modem which can work on GSM 900/1800MHz frequency. This is a good MODEM which can also be used for sending SMS through SCADA system. This tutorial will guide you for making your own Power and Ignition cable for MC52i terminal, if original cable is destroyed or shorted. Subscribe to Automation-Talk by Email. Jack of MC52i terminal is a female 6-pole Western plug which is used for power supply, ignition and power down. 1st pin of the jack is used for power supply and 8V to 30V can be applied on it. It is donated by PLUS (+). 2nd and 5th pin are free and 3rd is for sending power down signal. 4th is for providing ignition signal. 6th pin is used for ground signal and is denoted by GND. The pin arrangement is shown below. 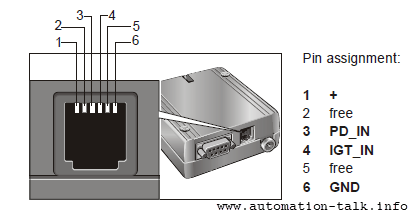 To make your own cable you can simply use Pin 1 and Pin 6 with a 2 wire cable if you are not using other functions. When MC52i terminal is powered ON, the IGT_IN signal is activated automatically. After start-up, the MC52i terminal enters the net searching state. To turn off the MC52i Terminal use the AT^SMSO command, rather than disconnecting the mains adapter. This procedure lets the MC52i Terminal log off from the network and allows the software to enter a secure state and save data before disconnecting the power supply.